This house, built after 1900, was originally a two-story frame residence with a projecting bay and wraparound porch. A fire in 1989 destroyed the second story. Barrett Visanska (1849-1932), a jeweler, bought the house in 1913. 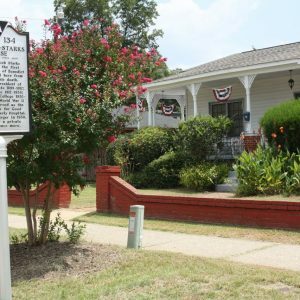 In 1938 Dr. John J. Starks, the first black president of Benedict College, bought the house and lived here from 1938 until his death. Starks was president of Seneca Institute 1899-1912, Morris College 1912-1930, and Benedict College 1930-1944. After World War II this house served as the nurses’ home for Good Samaritan-Waverly Hospital, created by merger in 1939. It was later a private residence again.